As the below graph from the OECD 2010 report Sickness, Disability and Work: Breaking the Barriers shows, increasingly, PWD are accessing a disability benefit due to the lack of employment opportunities. Unlike the overall unemployment rate, which has risen and fallen in line with periods of economic recession and growth, the disability recipient rate has been steadily increasing since 1976, and particularly since 1990. Speaking to the ABC, John Della Bosca, National Campaign Director for Every Australian Counts, a campaign group for a National Disability Insurance Scheme, referred to the employment rate and Australia’s ranking as a ‘national shame’ that needs to be addressed. Earlier this year, the Business Council of Australia and the Australian Medical Association released federal budget submissions, the aim of both being to encourage greater participation by PWD in the social and economic life of the nation. One simple way that employers can make workplaces more accessible to PWD is by providing appropriate tools and equipment. One tool that is used in most jobs, and in many jobs for the vast majority of the day, is the computer keyboard. 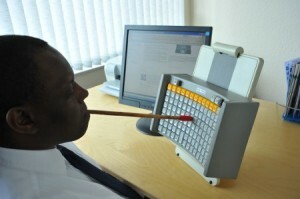 Maltron keyboards come in dual hand, single hand (left or right) and head/mouth stick formats, all of which are designed to fit natural hands/hand/head movements and meet the needs of people with limited or no use of their upper extremities. Or to minimise further damage to those with repetitive strain and other similiar injuries. If you would like to purchase a Maltron keyboard for yourself, or if you are an employer who would like to make your workplace more disability friendly, please don’t hesitate to contact us.